The oreeginal vinyl copies released in 1968 haed the baund's name embossed on a white backgrund. These pressins war an aa nummert. Design bi Richard Hamilton. 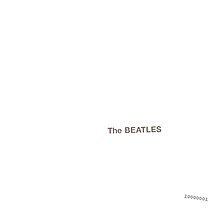 The Beatles, an aa kent as the White Album, is the nint studio album bi Inglis rock group the Beatles, released on 22 November 1968. This page wis last eeditit on 13 Apryle 2017, at 17:33.